1.Built ahigh capacity rated 2200MAH maintenance-free lead-acid battery(based on customer needs change) in the rechargeable led emergency light as power. 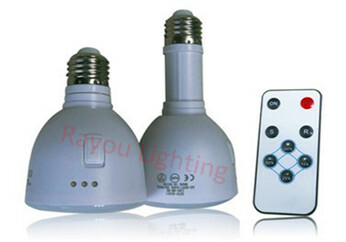 2.Energy saving,high power,long life LED bulbs can be used more than 50,000 hours,directly a range of more than 150 meters. 3.30pcs or 40pcs SMD LED lamp beads for lighting,. 4.Shell adopt a new ABS material,good finish,high brightness. 5.E26 or E27 base directly using. 7.Offer colorful plastic bukect box to pack.